Classic and timeless. These seem like two opposite concepts. 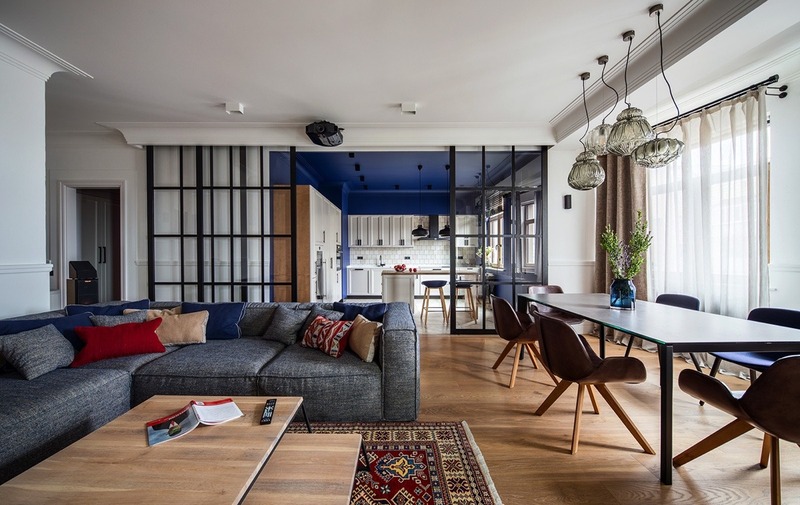 How do you create a home that is both? 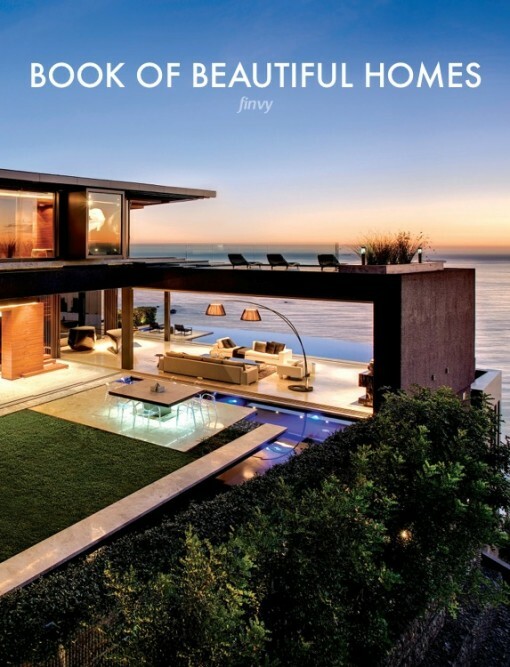 A home that is current and modern, while being able to withstand the test of an ever changing world of fashion? Impossible, some claim. But is it really? 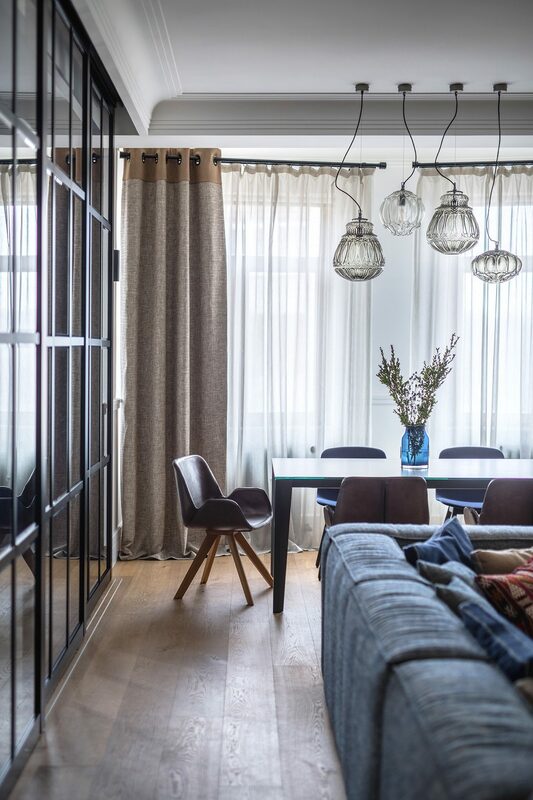 Oksana Dolgopiatova, a designer based in Kiev, took it upon herself to meet this challenge. Apartment 'Alise' is her answer, and isn't her answer just brilliant? 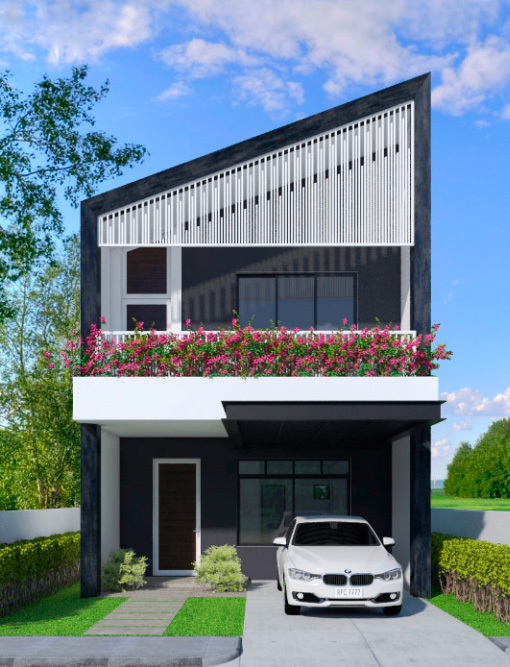 The apartment makes masterful use of different design elements to create a sophisticated home that resonates with fashionable and stylish homeowners. 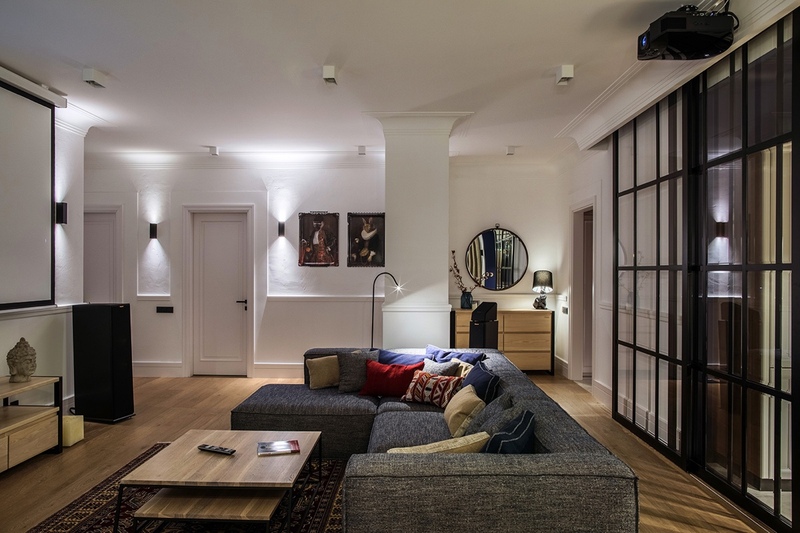 Take a look for yourself, and decide if this apartment is both classic and timeless. We start our tour in the open-plan living area. 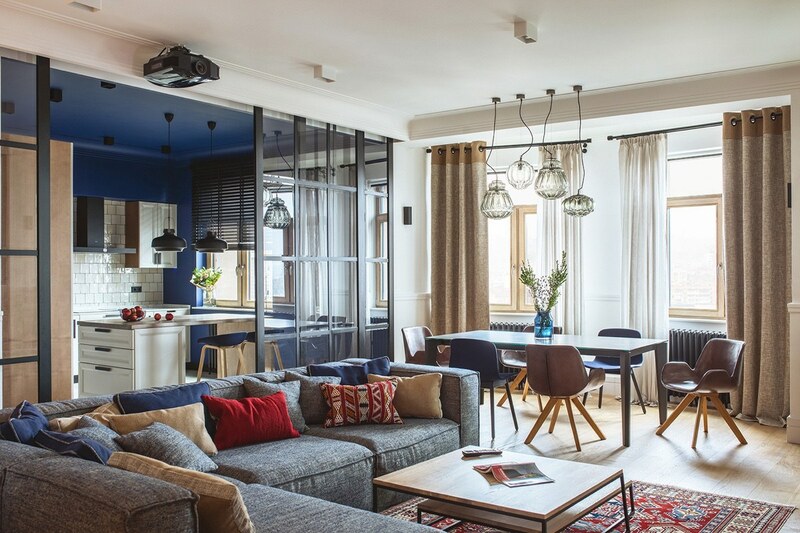 Here, we find a variety of colors and patterns blended to create a sophisticated living space that is lively and engaging. 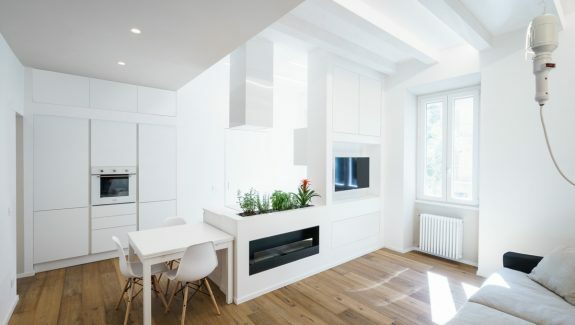 The walls are mostly white, allowing for a wide mix of design aspects to warm up the area. Deviating from the usual T.V area, an overhead projector turns the living room into an impromptu cinema for entertaining guests or the best movie day ever. Throw pillows that move up from the grey of the couch to the colorful patterns of the gorgeous rug, are an excellent idea that adds to the stylish comfort of the living room. 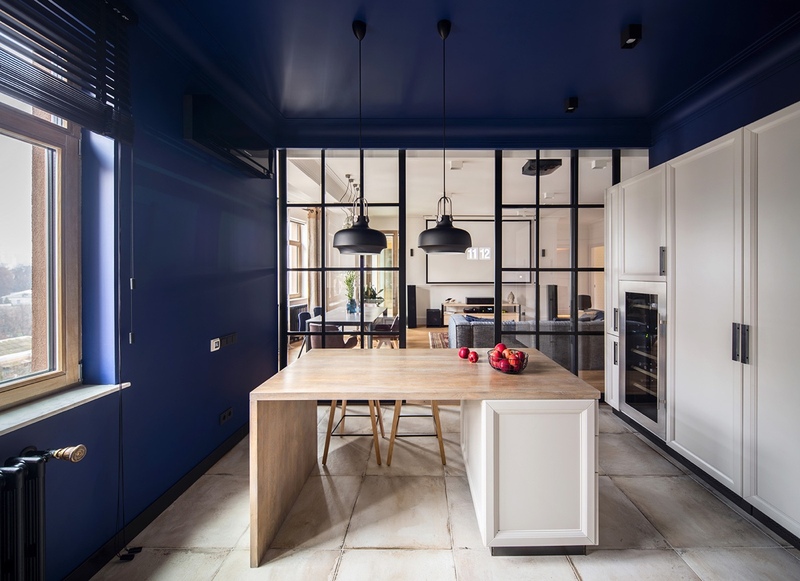 A panelled glass sliding door encased in a black frame separates the kitchen from the main living area, this adds a slight industrial element that is very stylish, the raw aspect preventing the room from looking plain and boring. 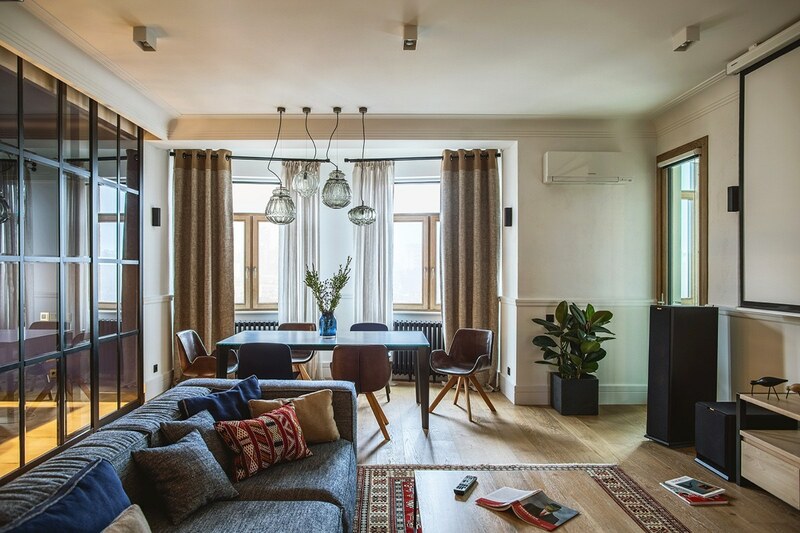 The soft brown of the curtains matches with the timber floor boards and green pot plants, softening the entire space and giving it a homely feel. 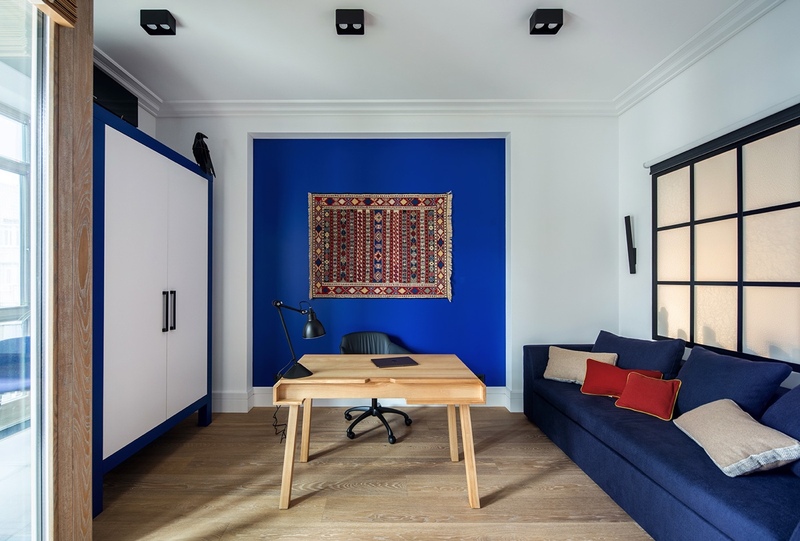 The blue vase holding the plant is a subtle way to add color to what would otherwise be an achromatic corner in a colorful room. 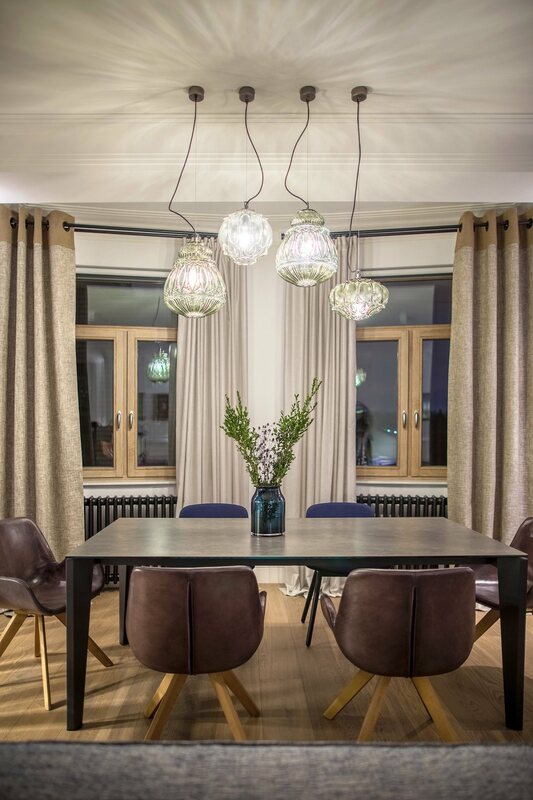 Modern dining pendant lights made out of patterned glass hang from the ceiling, lighting up a crucial part of the room and add a luxurious feel to the space. Two blue chairs add to the color brought by the vase. 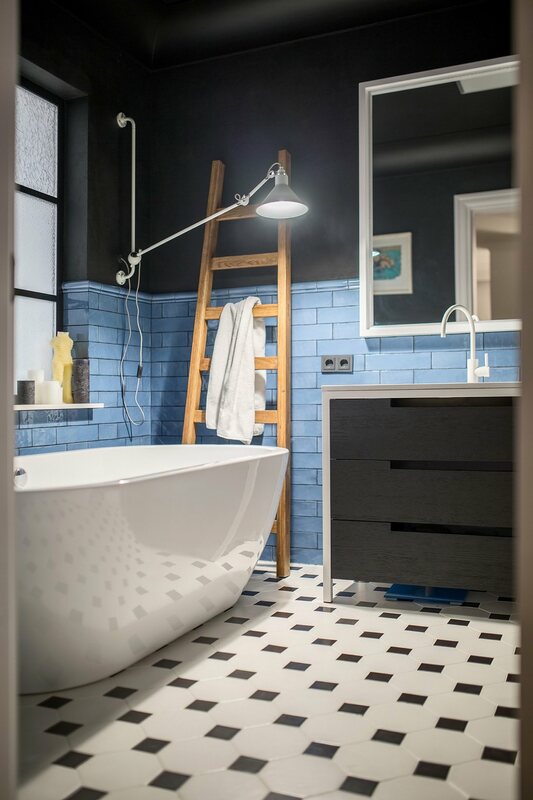 Black grating continues the subtle industrial undercurrent and wooden window frames warm up the clean glass. 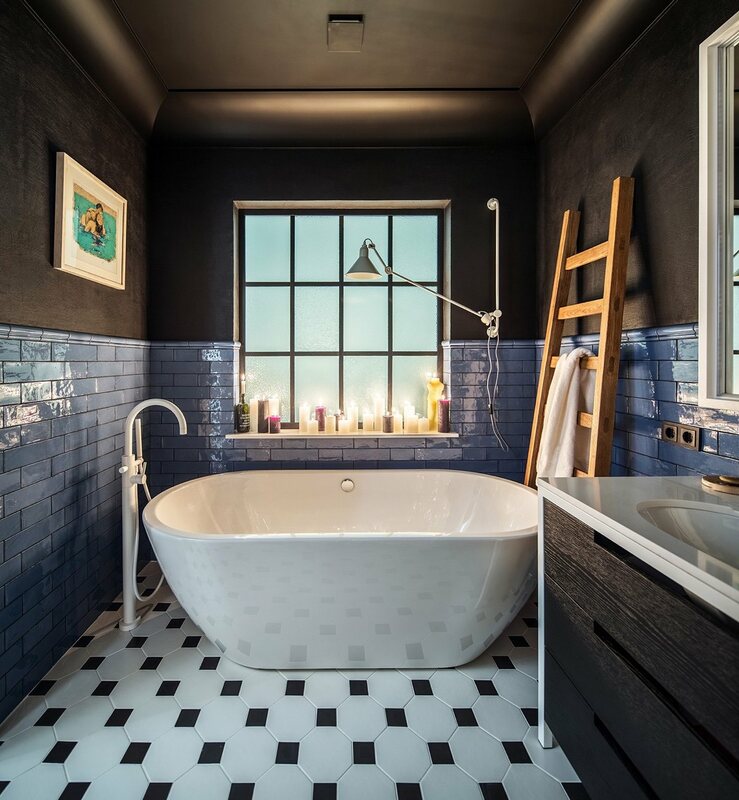 A frosted glass window with a black frame is a unique design aspect, the frosted glass hiding the bathroom, the light fixtures turning the window into an industrial element. Simplicity is timeless. 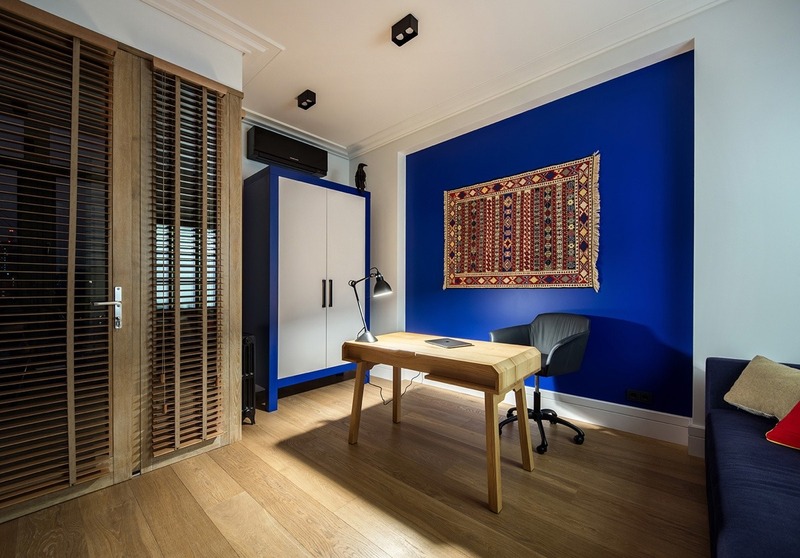 The study is a cheerfully professional space. The crown moulding and edges of the wall are a clinical white with an engaging shade of blue painted in the middle. A woven wall covering completes the look, achieving a stylish accent piece with ease. 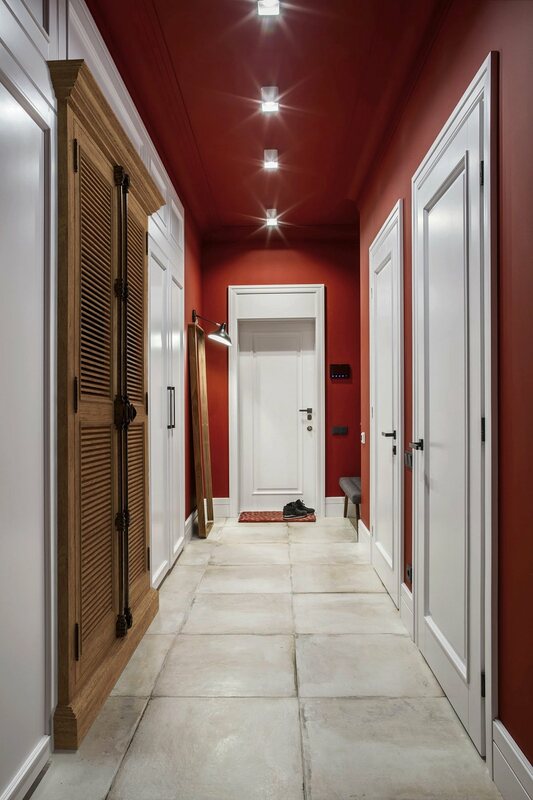 Once again, warm shades of wood neutralize the brightness of the wall colors and tone down the clinicity of the white. The overall effect is a cheery room that doesn’t hurt the eyes. Bookshelves are a necessity in a study, but they don’t have to be boring. 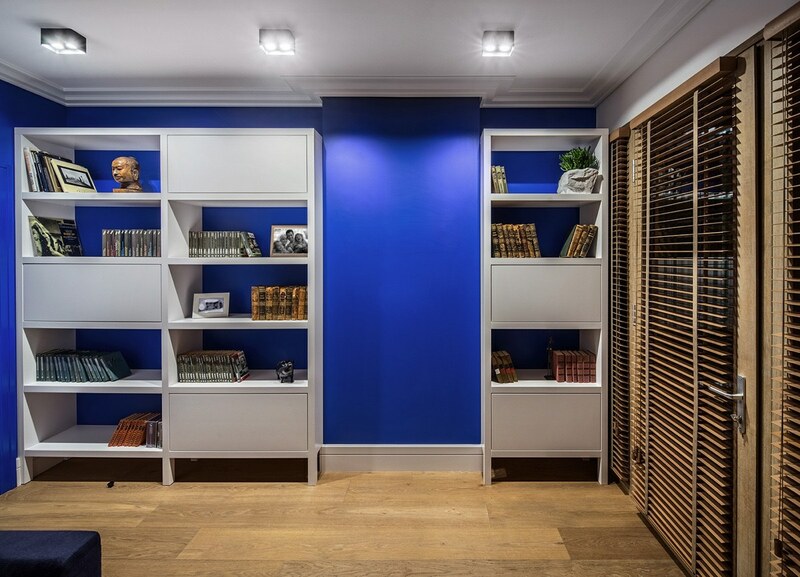 The designer removed the backs of these bookshelves to merge them to the wall, adding a subtle pop and livening them up. 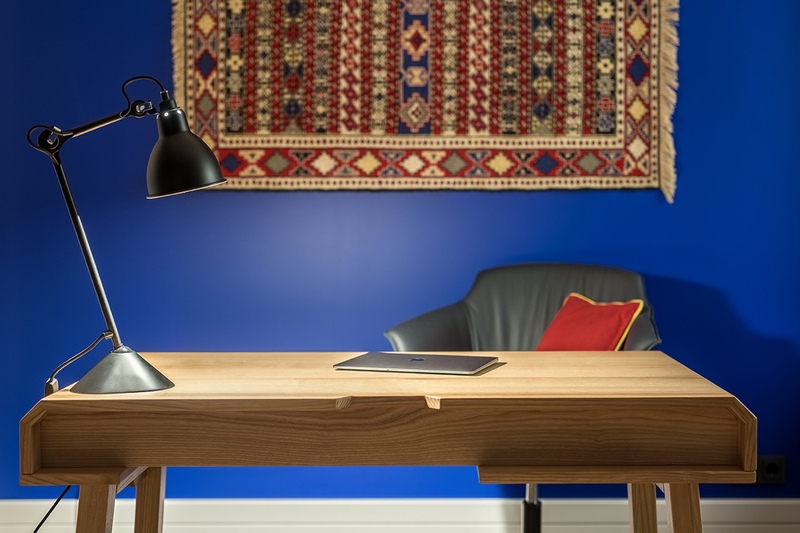 The desk itself has been left mostly untouched except for the classy desk lamp, which allows the homeowner to work in an uncluttered space. The leather chair looks incredibly comfortable and ensures that the homeowner has a proper place to work. The kitchen is a state-of-the-art marvel. 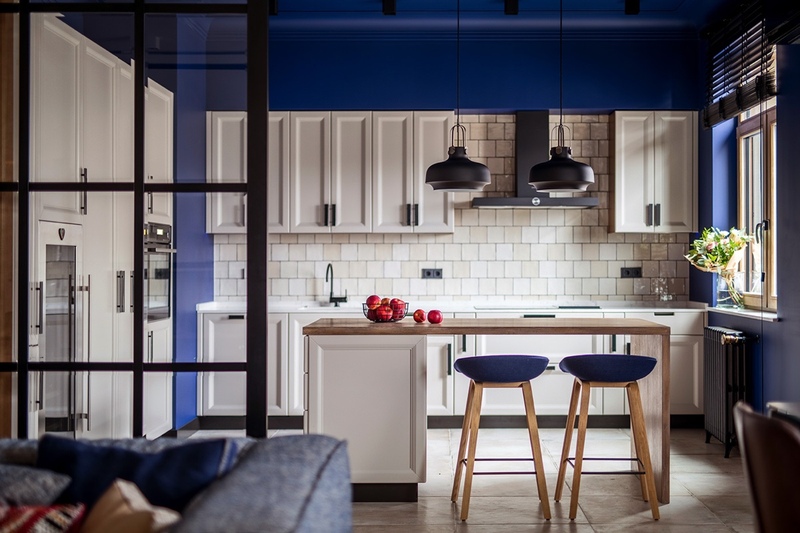 Industrial light fixtures hang over a tropical kitchen island while dark blue walls tie together all the elements to mirror the apartment’s theme. 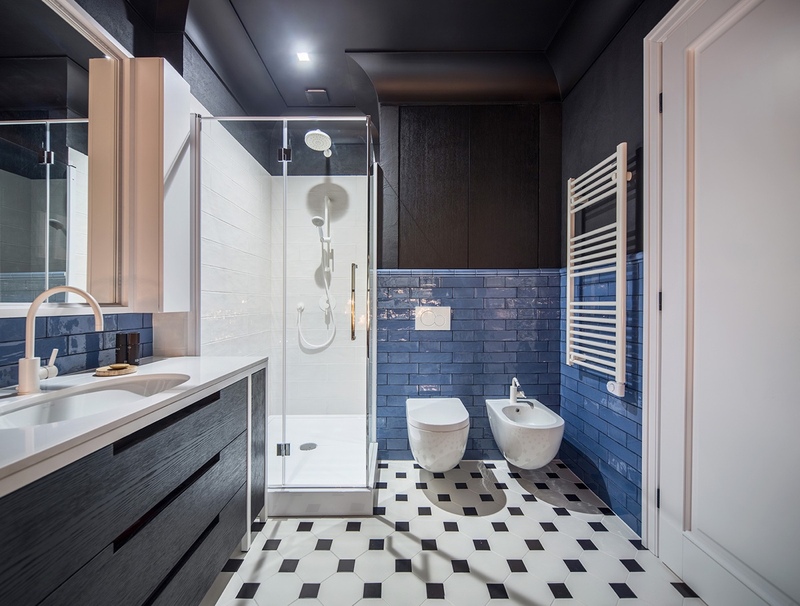 A tiled accent wall breaks up the blue walls and prevents the color scheme from becoming overwhelming. The two pendants lights match beautifully with the kitchen counter stools. 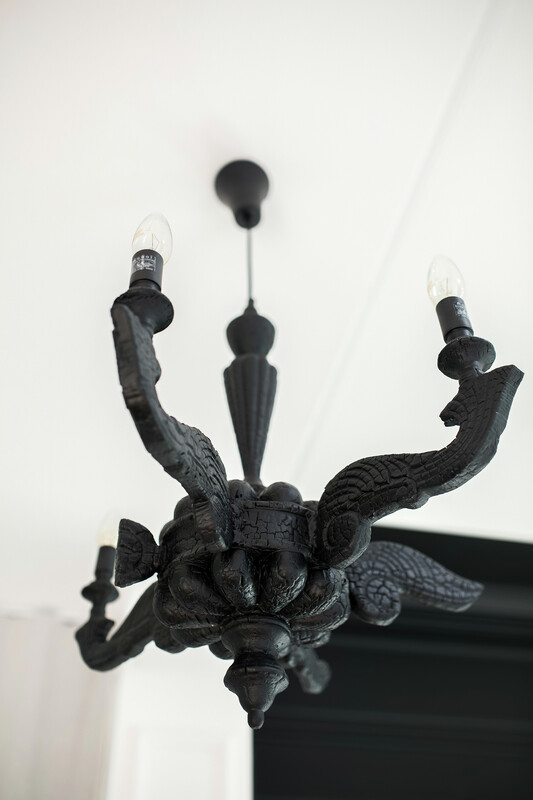 A detailed gothic light fixture adds a level of sophistication in a subtle and understated way. 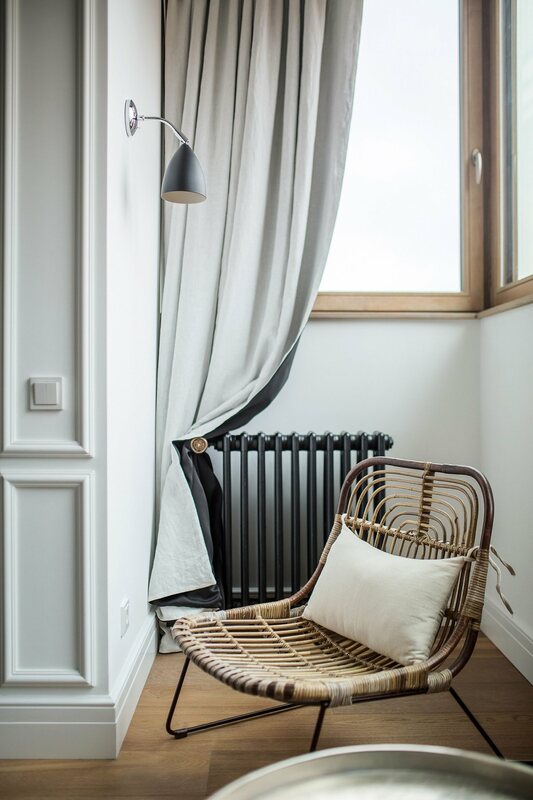 A designer thatched chair with a comfortable pillow is nestled into a light and airy corner, it makes for an attractive aspect to the room and a cosy place to relax with a warm beverage. The entrance to a house is important. It’s the first impression you get from the house. It needs to be impressive and functional. 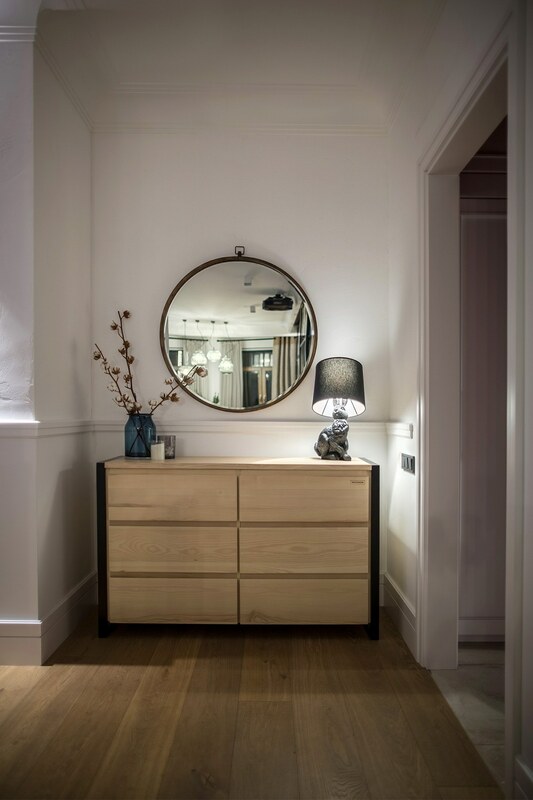 From the bright color paired with clean white lines, wooden elements and inconspicuous black fittings, this entrance hall is a perfect reflection of the apartment that it leads into. Warm wooden elements are the ideal way to add a little tropical homeliness to a space, this room is no exception. 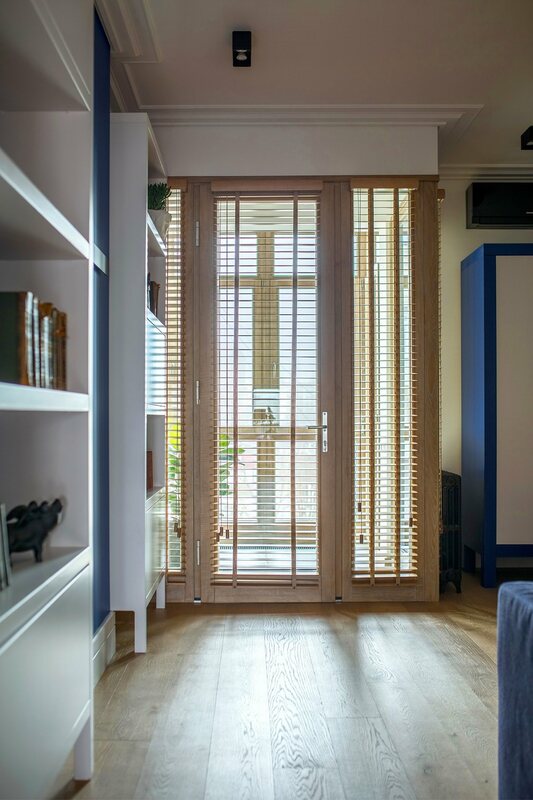 Bamboo blinds connects the door to the wooden floor panels without obstructing too much natural light. Usually nooks and corners can be a pain. But if you have the right accessories, they can become an essential feature in the overall space. A table, or in this case- a chest of drawers, is your best bet. Adorn the main piece with eclectic ornaments that reflect the homeowner’s personality and round it off with a mirror. The possibilities are endless, but the result is the same: perfection. 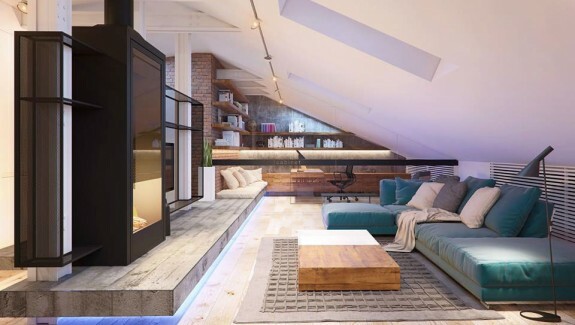 This seating area in the main bedroom looks over the cityscape and is an ideal place to relax with your significant other, and just have a nice chat. It’s also a light contrast to the rest of the dark features in the room. 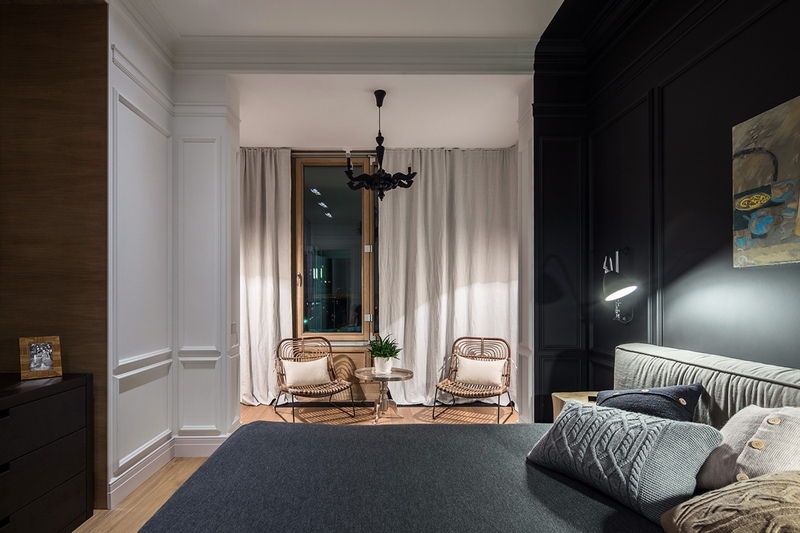 Showcasing the concept of simple aspect walls, the designer had the wall by the bed painted black and adorned with a modern art piece, and the effect is flawless and engaging. Adjustable light fixtures give the traditional bedside lighting an industrial spin, and can be arranged to create the beautiful light arc as showcased above. An assortment of comfy throw pillows work with the art piece to liven up the room, keeping the black wall from becoming overpowering. These designer bedside tables merge two design concepts together. 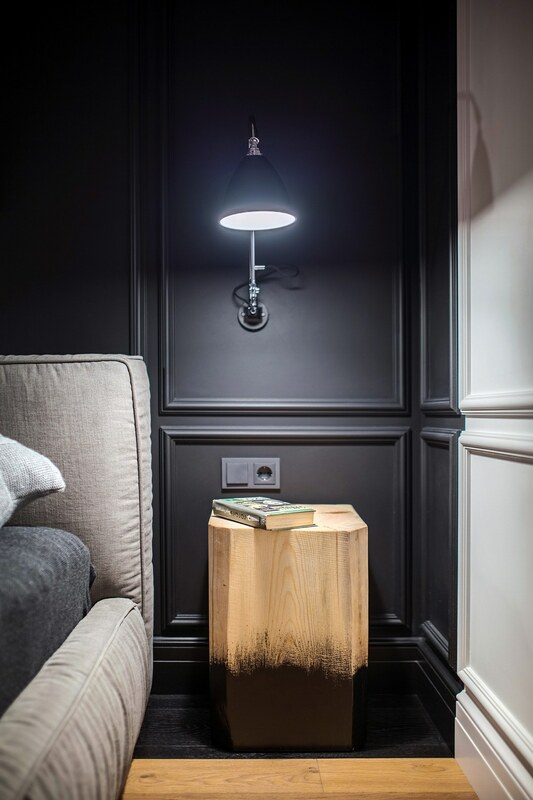 The wooden piece warming up the dark surroundings, but the black paint at the bottom joins it to the accent wall. 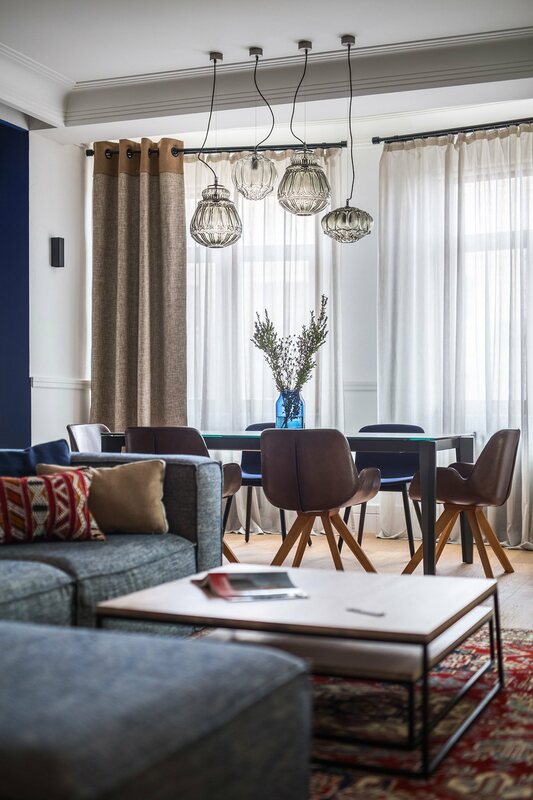 The designer gothic chandelier joins the airy seating area to the sophisticated room, so that the space isn’t disjointed and separate. 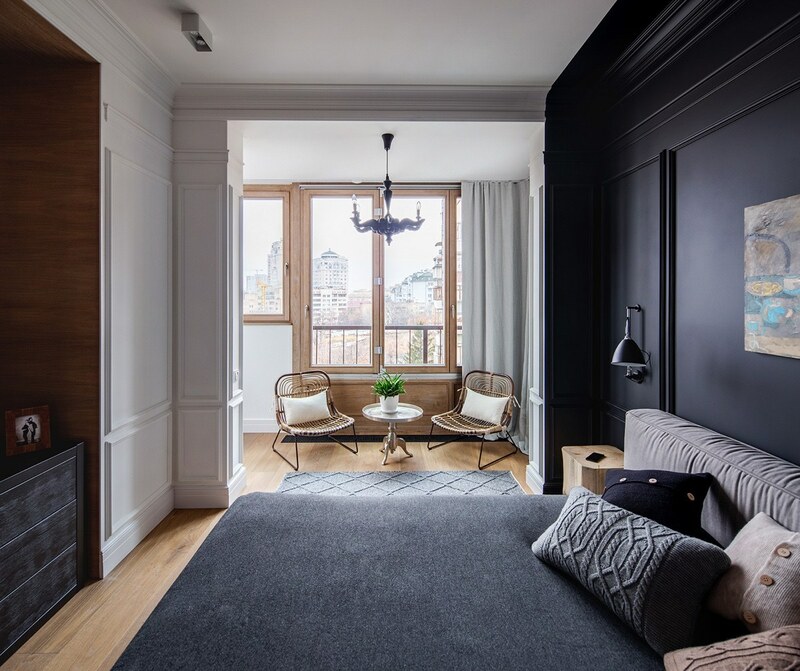 The master bedroom is a perfect blend of light and dark, industrial and sophistication. 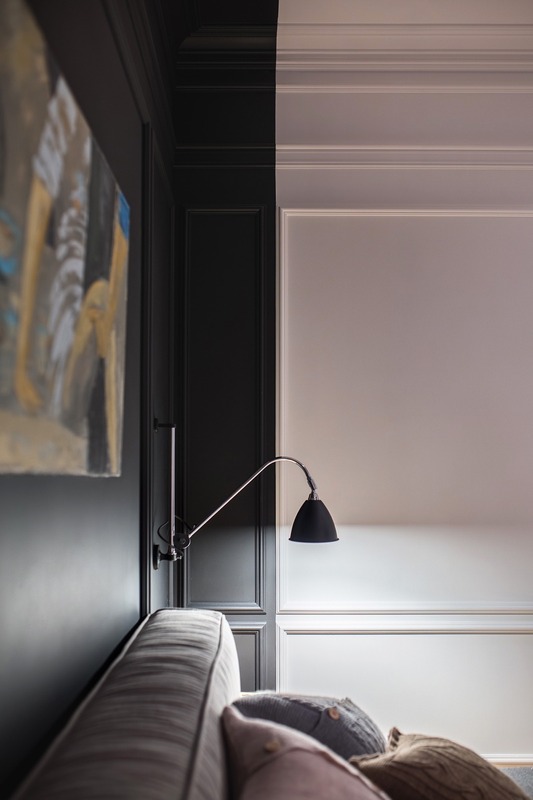 Apartment ‘Alise’ is a beautiful blend of light and dark, warm and cold. The main bathroom is no exception. The dark top half contrasts delightfully with the cheery bottom half, with both sides merging aspects of the other side. For example, the colorful art piece brightens up the black wall behind it, while the black drawers of the table brings sophistication to it’s cheerful surroundings. 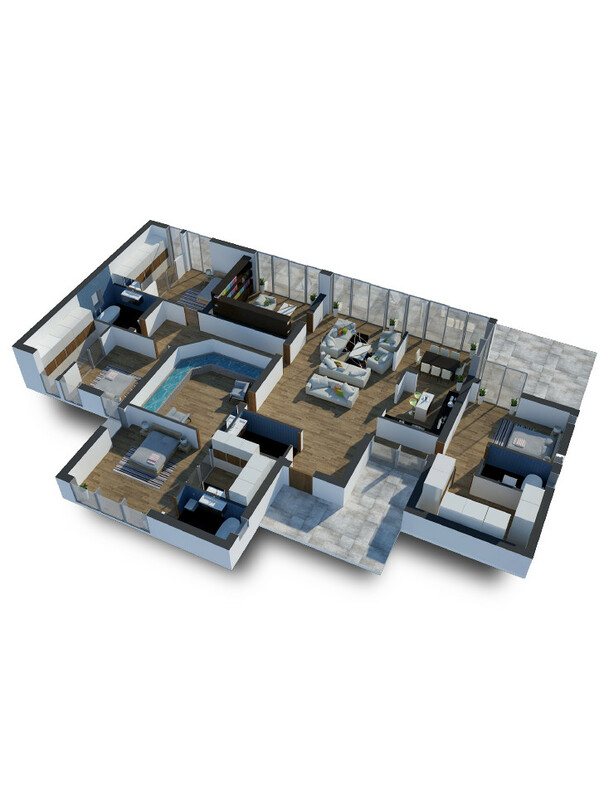 The bathroom is spacious, and makes use of the space by providing his-and-hers amenities, a truly luxurious aspect. The luxury is continued in the shower with the contemporary shower fixtures. The minimalist matte-white faucet completes the look. 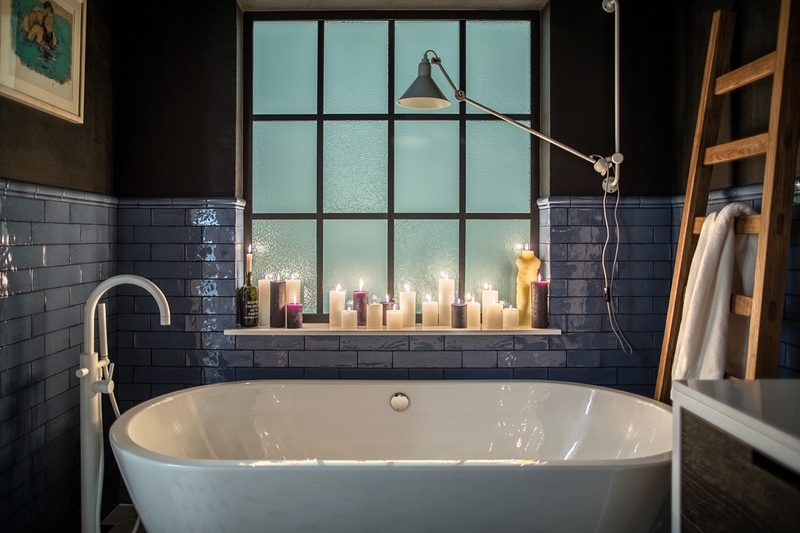 The bathroom is the one place in the house where you can never have too many luxuries. 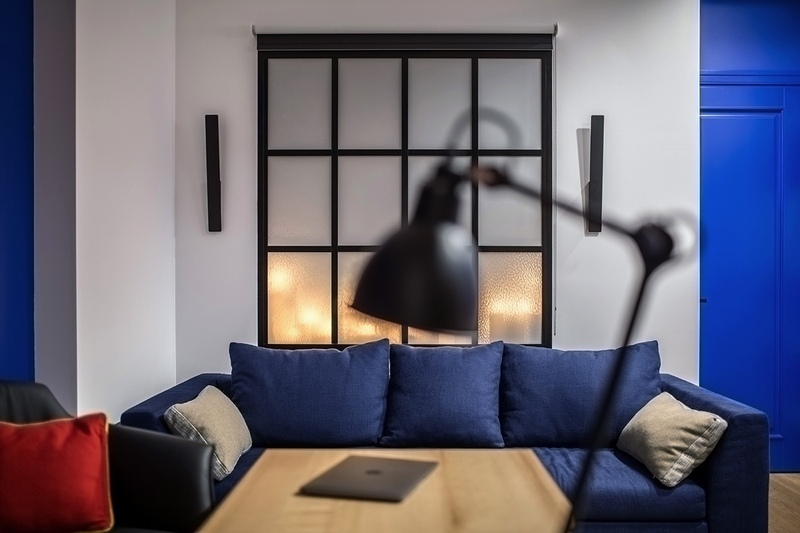 A collection of candles by the frosted window is a stylish element, that allows for adjustment in the ambience, from stark and bright to relaxing and romantic. 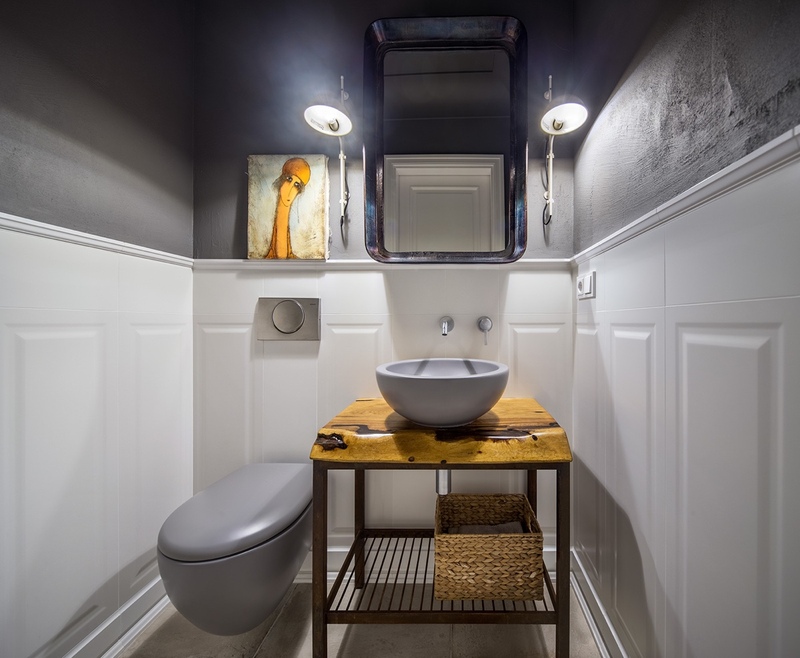 The guest bathroom makes use of a monochromatic color palette that is interrupted by the bright stand alone amenity. 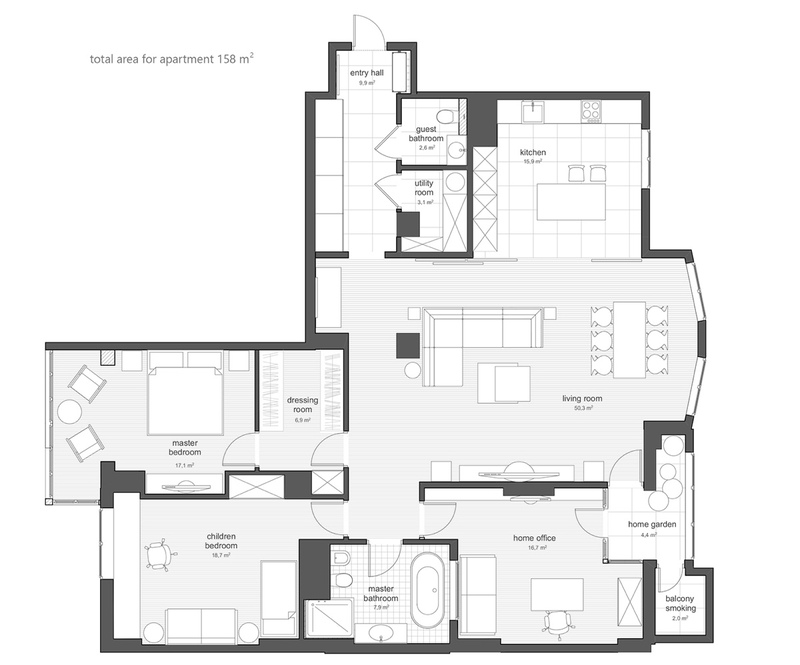 The apartment is spacious and boasts an open plan living,dining and kitchen space. Two bedrooms,bathrooms and study. The master bedroom even has a changing area. Each room has been tailored to perfection and is a wonderful mix of style and sophistication.